As promised yesterday I am posting recipes for ‘Salsa Verde’ and ‘Salsa Roja’, two staples of the Mexican tables. Wherever you go, whether home or restaurant, when you sit down to eat there are both salsas sitting on the table. Both are very similar in nature and are a nice spicy condiment to use at you discretion to spice up your meal or to use as a dip for bread or ‘totopos’. The salsas are named for their colors, and the difference between the two is the main ingredients. The ‘Verde’ uses ‘tomatillos’ a green ground tomato, and the ‘Roja’ uses tomatoes. There are many methods of preparing these salsas and they can be made with raw ingredients or cooked, they can be chopped finely or made in the blender. For raw salsas you simply put the ingredients in a blender and pulse until you have the consistency you wish. For cooked salsas the procedure varies with the actual cook. You can grill the chiles and the ‘tomatillos’ or tomatoes on a very hot ‘comal’, a circular sheet of metal that you put directly on a stove’s burner or over coals. Once the skin is burned, you peel them and prepare as usual. An alternative is to chop and cook them in oil then add the chopped onions and garlic. You can also blanch them in boiling water for a few minutes and then peel them before chopping or blending the mixture. With all of the cooked version the cilantro is added once cooked and then you salt to taste. I specify chiles jalapeños for the recipes, but the salsas are also commonly made with chile Serranos, or with a variety of dried chiles like anchos, chipotles, pasillas, guajillos, or whatever type of chile that the cook prefers. I am posting here a simple raw version of the salsas, but you can experiment with cooking the main ingredients and with different chiles. I normally prefer most red salsas, and Normita’s passion is the green ones. Have fun experimenting with those salsas and leave in the comments your favorite variations. 1. Cut tomatillos or tomatoes in quarters and place in blender or food processor. 2. Cut chiles in half and remove the seeds and membrane add to the blender. 3. Cut the onion in quarters and add to the blender. 4. Add the peeled garlic cloves to the blender. 5. Pulse the blender or food processor until you have a coarse salsa. 6. Add cilantro and pulse briefly. I was asked a few times in recent days about what to do with the marinated arrachera meat that I gave my recipe for some weeks back. The simplest dish that I have seen is grilled arrachera. This is normally served in a lot of restaurant with some Mexican-style rice and some refried beans as side dishes. Warm corn tortillas are served with it so that you can make some nice tacos and they are garnished with either ‘salsa verde’ or ‘salsa roja’. I will post recipes for both salsas tomorrow, and will prepare recipes for some other delicacies that can be made with arrachera meat. This recipe is best prepared on a real charcoal grill, but can be done easily on a gas grill, or in a grill pan on the stovetop. 2. Cook the arrachera until the doneness you prefer. It is normally cooked a little more than you would normally prepare a steak. 3. Serve the arrachera on a wide oval plate with the chiles and green onions on top, and with a portion of Mexican-style rice and some refried beans on the side. 4. Top the refried beans with a few ‘totopos’ stuck into them. 5. Prepare tacos with the cut arrachera and garnishes and top with either salsa. "the wines aren’t for the wine-savvy crowd but for the barbecuing dad who wants to have a nice tasting wine without having to learn about terroir and varietals"
What exactly does knowing technical information about a wine has to do about enjoying the taste of a wine? I have been involved in the wine trade for over 20 years and I have always been stunned by that kind of thinking. When I met Normita she did not know anything about the technical aspects of wine and of wine tasting, but she sure could easily know if she liked a wine and could greatly enjoy them without this knowledge. Most of the time, the knowledge can even get in the way of enjoying wine. Years ago, when I was organizing weekly wine tastings at the wine store a friend was managing, we did some nice tests to prove this idea of mine. We organized a formal tasting for a group of friends who belonged to a local wine club. All of those people were wine fanatics and they were armed with a vast knowledge about the wines we were planning to taste. We had originally planned a tasting of over a dozen wines, but to test this crazy idea of mine we decided to narrow the selection to about 6 or 7 bottles and created an event where there would be a blind tasting first where the tasters did not know anything about the wines they were tasting, followed by a regular tasting of the same wines that ranged from good tasting low-end ones to a very expensive, but overhyped, one. The tasters were told that the two flights of the tasting were different wines and that we would compare notes at the end of the evening. I led the tasting, and tasted the first flight blind without knowing which one was which and noted the wines accordingly. We then followed with the regular tasting where the crowd could apply their vast knowledge of the wines to the bottles that they now could see. The results were amazing. In the blind tasting one of the midrange wines came out ahead by a wide margin followed by the cheapest one, and the expensive one came out dead last. The regular tasting of the same wines coming from the same bottles was totally the opposite. The wines came in exactly in the order of price and reputation. What had changed between the tastings? The wines were the exact same ones, but the tasters now could let their opinion and knowledge color their judgment. I have seen this happened over and over again and it is something that we should always keep to the back of our minds when we taste wines. We should always remember that it is only fermented grape juice and no amount of knowledge should color our opinion on if we enjoy the wine or not. Let us enjoy the wines that we do enjoy, even though they might not have the prestige of some of the overhyped brands, or of the proper vintage and terroir. The important thing is that we enjoy fully what is in our glass. Knowledge is important if you want to analyze the experience fully, and if you need or enjoy the technical side of the wine experience, but remember that this knowledge does not change the taste of the wine in your glass and it might even color your judgment. Those of you who do not know us, would not know the story of how Normita and I met. We were one of those lucky couples who met in the early days of the Internet. Back around the winter of 1998 we started exchanging emails regularly after Normita sent me a message in some forum. She was in Mexico City and I was spending my time commuting and working between QuÃ©bec and Washington, DC. We started an extended daily email exchange that lasted for 4-5 months until one day her parents were planning a holiday trip to Canada and she decided to take some time off from work and join them. Before she left we agreed to meet in Montreal for a day when her tour was passing through town. We both were nervous about this, even though we had been sharing our thoughts and lives daily for months. Strangely enough we never had spoken to each other and it was strange when she called me the day before we were supposed to meet to confirm. To make a long story short I planned a nice picnic for our first meeting, and we agreed to meet at her hotel so that I could pick her up. After somewhat of a false start, since they put them in a different hotel across the street and she was calling my cell phone to let me know about this, and she was thinking that I really did not want to see her as I was not answering. What I had forgotten to tell her, was that my cell phone was one of these huge in-car units, as to get any service in the mountains where I lived at the time I needed one of those powerful monsters. I was waiting at the hotel she had told me, and she finally went there to check and it was love at first sight, but that is another story. We left for visiting the city and later to our picnic at the top of the Mont-Royal and we have enjoyed regularly picnicking since the first day we met. Over the years we have tried many different ways of picnicking in style, and our favorite was always the ones we enjoyed on our pontoon boat on the large lake where we lived in the Laurentian mountains of QuÃ©bec. We could slowly circle the lake listening to nice music on the stereo and enjoy looking at the scenery while slowly eating our nicely prepared picnic. We also regularly did some fun picnics while cycling. Actually not while pedaling the bicycles, but by cycling to interesting destinations and eating there. The common denominator to what we have always enjoyed was the style of food we always brought. We have a tendency to get on the fancy side of cold picnics with nice shrimps, smoked salmon, foie gras, and stuff like that. I think that it dates back to the days when I was living alone and traveling all over the world all the time, and I used to have little picnic feasts in my hotel room. I’d buy a bottle of nice champagne, some caviar, foie gras, shrimps, and smoked salmon, as well as a nice baguette and have my little celebratory picnic on the hotel bed. I enjoyed it so much that once a month, when I was at home; I did the same in the living room while watching some movie on TV or listening to some nice music. Since we like to picnic in style we assembled a nice picnic basket with some nice place settings, good quality cutlery, some nice clothe napkins, and some sturdy quality acrylic glasses, though most of the time we were bringing real crystal INAO standard tasting glasses wrapped in some thick dish clothes, as they are very versatile and somewhat more robust than regular stemware. We have not had the opportunity to picnic much in recent years, but we plan to do so again. In the coming weeks I plan to start assembling a new picnic basket so that we can have it ready for whenever we feel like jumping in the car and having a nice picnic in style. Normita bought me a nice little portable gas BBQ grill last summer, and we only found the proper propane bottles for it last week, so we might get even a bit more involved in our picnicking this time around by preparing some cooked dishes on-site. As I mentioned a few days ago I was planning to post a few recipes using Oaxaca cheese. Here is another one that is a spicy version of the typical pasta with cheese sauce. It makes for a different taste experience and could also be served as a side dish with some arrachera to make a definitely innovative combination. ‘Epazote’ is a traditional Mexican dark green herb with a very peculiar smell. It is normally available in most Latin American grocery stores. It is used a lot in a variety of Mexican dishes. 1. In a large pot bring the water with salt to boil and cook the pasta until tender. 2. While waiting for the water to boil, in a heavy saucepan over low heat, melt the cheese in the milk, wine, butter, ‘epazote’, and chiles. 3. Remove from fire and add the yolks and whisk rapidly. 4. Return to fire at the lowest possible setting and heat for some minutes making sure it does not boil. 5. Season with salt and pepper to taste and serve on the cooked pasta. …that’s the question as spring is approaching quickly in Europe. But what is the essence of grilling and barbecue? It seems there are many answers, leading to excessive disputes among grilling aficionados. I was recently reminded of that dilemma when overhearing the discussion on a neighboring table during a nice dinner. Two couples in their late 40ies/early 50ies were celebrating a birthday and during the dinner, on of the guys mentioned that he had recently ordered a high-end Weber gas grill. That’s when the other guy went ballistic and proclaimed that no matter how much one spends on a gas ‘grill’ real grilling would never be possible. The discussion continued for the rest of the evening. So what is the essence of grilling? Personally I see two criteria and both should apply. One is procedural: meat, fish or whatever is grilled, is heated by applying radiation heat from a very hot surface. The other is more hedonistic and it’s about grilling aroma that partly results from the procedural, partly from other causes as a lot of other factors are contributing to the aroma. There are many ways to grill, modern and traditional ones – including some that simply are not feasible in our modern world, at least not for even very accomplished grill hobbyists. In our daily lives we typically use a compact grill that can be fired by charcoal or wood, by gas or even by electricity. The later is a matter of dispute as usually you don’t get the intense heat and the heat capacity of the previous methods and, even worse, usually electric grills don’t feature a real grate where fat and juices can drip through, but a wavy surface operating as a contact grill. That is the same principle used in grilling pans, the meat (or whatever) only rests on minor part of its surface while the heat radiates and convects more or less freely in the wide ‘valleys’ between. I wouldn’t consider it ‘real’ grilling but the results, if done properly, emulate ‘real’ grilling decently. The lack of real ‘grill’ aroma is balanced by a lower health risk from the nasty chemicals that are in the aroma. It’s similar to grilling on a real grill but putting the meat or fish in aluminum pans – healthier, maybe, but way duller – eat your heart out, George Foreman! In a ‘real’ grill there are three key elements to the procedural criteria. For heat radiation to function properly you need proper distance and high temperature on the heat source’s surface. And you need the capability to either provide high amounts or to store heat energy, as the environment will cool the heat source’s surface. This can be effectuated by the possibility to produce a lot of heat and/or by storing – which is the secret of lava stone grills and the famous Weber Flavorizer™ bars. Charcoal is perfect in this way as it can produce searing heat, especially if ‘encouraged’ by a blow dryer, and it stores a lot of energy on the inside. The results of the high temperature, the right distance and high heat capacity are simple yet stunning. The surface of the meat or fish will get denaturized very quickly, sealing off juices, moisture and flavors on the inside while making fatty tissue and skin crispy. Any liquids dripping on the heat source will evaporate quickly adding to the aromas. If the meat of fish has been marinated or basted or rubbed, the aromates on the surface will be melted into the crust adding to its taste. This said, there are several considerations for grilling and some do depend on the type of grill you use. Generally speaking, fatter meat or fish comes out juicier and tastier but it’s a matter of personal preferences and health considerations. If you want or have to stick with leaner cuts or types, you may consider marinating. High heat for short grilling times is also essential so it doesn’t dry out. Thus a charcoal grill may be the better bet here. Also keep in mind that many flavors and spices are not only enhanced by fat, they dissolve and spread in it. Thus for lean cuts the spices and herbs should work well without fat – examples are salt, lime and lemon juice, beer, chiles. Marinating lean cuts with olive oil can be a healthy alternative too. Another great enhancer, no mater what type of grill you use and no matter whether you prepare lean or fatty, is smoke. Nothing beats the delicious aromas of a wood grilled steak. If you’re firing gas or charcoal, use wood chips to add to the flavor. Depending on heat, duration and amount of chips this can reach from just a touch to hot smoking. I remember one occasion where we ran low on charcoals so we marinated the salmon a bit, put a lot of wood chips in the grill, closed the lid and 30 minutes later we had the most tender, juicy and delicately grilled/smoked salmon ever. In a charcoal grill you can simply throw the chips on the coal. Gas grills sometimes feature smoker compartments. A cheap and easy alternative is a small smoking pouch made of aluminum foil (thanks to grill guru Steve Raichlin for this tip – his books are the best on this matter). Also keep in mind that usually you will soak the chips in water, beer or cider for 20 minutes before using them so they burn and smoke slowly. If you’re doing thinner cuts of meat or fish that only take a short time, using dry chips instead will enhance the aroma. While dripping fat that flares up (bursts in flames) does provide strong aroma, it’s also very unhealthy. If you grill frequently, you should thus limit flare ups. There are several ways to do it, depending again on your grill. Gas grills usually limit them automatically. On charcoal or wood you can quickly move the meat, spray some water or beer or use an indirect grilling approach where the charcoal is on the sides with a dripping pan in the middle. The meat sits atop the dripping pan and is heated from the sides, fat drips into the dripping pan – this by the way is the only valid use of aluminum containers in real grilling. This works extremely well but isn’t fit for all kinds of dishes and usually takes way longer. Spare ribs are a good example of a perfect fit for indirect grilling. On a gas grill you can use the technique by only heating some of the burners. Talking health, if you’re grilling over charcoal you need to start the fire. Never use liquid starters as they add a lot of unwanted and unhealthy ‘aromas’. For best results use a grill starting chimney that works fine with newspapers and even better with those little solid starter cubes. As for sides, many come out wonderfully on the grill, so get them out of the kitchen. Among our favorites are tortillas, oven potatoes (we just wrap them in foil and put them close to the heat), corn on the cob, green onions and sweet bell peppers. Even if you prefer rice, noodles or couscous you can still add some smoke aroma by keeping them close to the barbecue. A final word on cleaning. Many people love to grill but hate to clean the grill afterwards. This need not be as some simple routines will take care of the cleaning almost by themselves. First of all, when you’re done with pre-heating, use a wire brush to clean the grate. Next rub it well with oil or fat, using your grill thongs. If the grate is hot and well oiled, meat and fish will not stick to it easily. When you are done grilling, let the grate reheat well – on a gas grill turn the burners to high again. After 5 minutes or so most residues will have burned off and you can remove any leftovers with the wire brush. So are you getting ready for the new grilling season? You bet we are – we already bought a new gas bottle for the big Weber monster on the balcony and a few bags of charcoal for the cheap little one on the roof. We prefer to have some choices, you know, and the best tool for every dish. Most important of all we will have fun and delicious food and often invite friends or family to join in – the more, the merrier. And we will NOT discuss what is grilling and what is not, we’ll just do it. The Padrino, when he visited us last December, had the pleasure to taste Oaxaca cheese. He told me last week that he found a similar Turkish cheese in Vienna and he was wondering what he could cook with it. Oaxaca cheese is a variety of spun cheeses that is originally from the state of Oaxaca in Mexico, and that is currently made all over the country. It is available commercially from the big cheese producers, and of course a much better ‘artisanal’ version is available everywhere from road-sides to the local tianguis. It is a cheese of ‘squeaky’ consistency, a term coined by one of our Japanese friends in QuÃ©bec when she called fresh cheese curds ‘squeaky cheese’ as it squeaks on your teeth when you eat it. The Oaxaca cheese is normally pulled into long stringy ribbons during its fabrication and then spun into balls ranging from grapefruit size to huge affairs over a foot and a half across. Its primary use is normally to melt over food, a little bit like mozzarella is used on pizzas. The simplest Oaxaca cheese recipe to make is a ‘quesadilla’ where a piece of Oaxaca is torn into strings and then placed inside a folded corn tortilla. This can then either be browned in a dry pan until the cheese melts, or pan fried with a bit of oil, or even deep fried. It is then served with your favorite salsa. A lot of other dishes are topped with Oaxaca as a last step before serving, and pieces of it can also be put in soups to give extra flavor. Following is a simple recipe for ‘Volcanes’ meaning volcanoes, which is very simple to make and very tasty. It is better cooked on a grill, but it can also be made on the stovetop in a dry pan, or in a pan with a little bit of oil. 1. Take each corn tortilla and spread 2 tbs of refried beans on it. 2. Top the beans with 1/4 of the Oaxaca cheese. 3. Cook on a hot BBQ grill, tortilla down, until the tortilla is nice and crisp and the cheese is melted. 4. Top with either salsa verde or salsa roja to taste. In olden days before train or automobile became common, transportation was mainly by carriages pulled by horses. While this was quite feasible for shorter distances, like going from your rural farm to market or the village pub and back, it was a pin for long distances as it took a lot of time. This in return resulted in a lot of inns and roadhouses along well-traveled roads where people would stop overnight during their travels. Even for shorter trips, like a trip to the countryside on the weekend, it was quite common to take one way trip on Friday, then have an extensive meal and stay over night, only to return the next day. This was not only done to more extensively enjoy the countryside, but for practical reasons, comfort and safety. After all there were no well-paved roads, broken wheels were common, no illumination along the roads and thieves and thugs roamed many parts of the countries. Add to that the fact that many overnight trips to the countryside had a certain gallant element; this was a very viable model. Today the need to stay over night after a dinner in the countryside is not as pressing anymore, though it still can have its advantages. As thugs and thieves have been replaced by police testing for alcohol it allows for adequate consumption of fermented beverages to accompany a nice meal without fear or guilt. The comfort factor holds still true – walk up a flight of stairs and collapse in a well made bed instead of driving back late on unknown roads for an hour or two and top it of with breakfast being ready for you the next morning. Pair that with the gallant element that still applies today and you get the picture. This said, yes, we do enjoy it occasionally, whenever our schedule permits it and we get a little incentive (that usually has to do with fine food or wine or both). It’s nice to flee out of the hectic city and enjoy a stay outside our busy lives. Last Thursday we had the latest of those escapades and it’s what I’m writing about today – after an admittedly long start. It is still winter in Vienna, unusually enough as normally at that time we get tulips and daffodils instead of this year’s ice and snow. Still we decided it was time for a road trip again, overdue actually, the last had been October 31st last year. The incentive was easy enough to find. A quite well-known inn about 1 hours from Vienna, Jeitler by name, had received it’s first Michelin star and has been celebrating this every Thursday with a ‘star menu’, a degustation menu with many samples of dishes that had helped the Chef, Gerald Jeitler, win the desired star. The one last Thursday was supposed to be the final one, though eventually they decided to do 2 more. Nevertheless we didn’t want to miss and took to the road. As we live in the North of Vienna and left around afternoon rush hour we took about 2 hours to get to the place. It’s located on the Eastern outskirts of the alps, an area that is looking quite alpine with lots of hills and smaller mountains, woods and an overload of nature. Beautiful in summer, but in winter a little challenging. Luckily it only started snowing when we were within 15 minutes of the target. We arrived, carried our suitcase up to the room and went for the dinner. We nicely started it off with a glass or local sparkling wine, nice, crispy, lightish, a very good aperitif. As if we needed anything to whet our appetites – we were all but starving as we hadn’t had a bite since morning. Of course they could help us there – with then aperitif, as if to keep us from starving, they served fresh cuts of baguettes with different herbs in them and little plates with butter, pumpkin seed spread and homemade ‘tapenade’ of black olives. The later was a very good preview of the kitchen’s talents as it was the best I ever had outside of those regions of France where they invented it. Politely they inquired whether we wanted the ‘star menu’ or would like to choose our own dishes. Well, we came for the ‘star menu’ so there was no discussion. 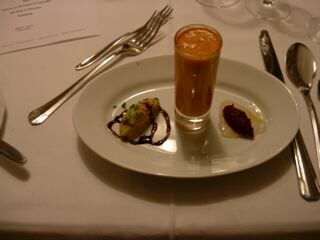 Next they brought the amuse bouche or, as it’s called over here, ‘Regards from the chef’. A nice lengthy plate with three delicious samples: left to right vegetable timbale with thyme, crème of sweet bell peppers and white fish carpaccio with fig confit. Each of them very distinctive and an explosion of taste on the tongue. Investigating why the tastes were so abundant we found out that they are using 100% natural ingredients, no substitutes or taste enhancers and prepare everything from scratch. Obviously a great idea in the age of convenience products and artificial flavors. 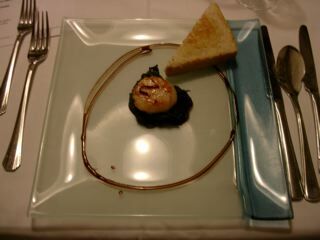 The menu started with a seared scallop on balsamic-spinach. Daring at first look, as good scallops are very delicate and their taste can easily be overwhelmed by strong aromas. The combination turned out stunning, not only for the eye as the pearly white of the scallop contrasts nicely with the dark leafy green, but also to the tongue. The scallops themselves were premium quality and prepared to the point and the balsamic aroma was discrete enough to underline them. We had a glass of nice local Muskateller wine, a very aromatic yet light and dry white made by a vintner named Broli from Gamlitz, Styria (Southern Austria). 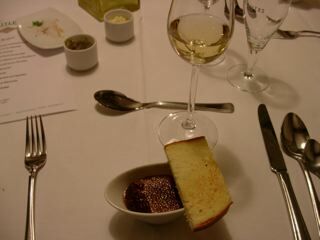 Next up was another stunner: goose liver crème brulÃ©e. Rich, soft, creamy with a crisp crust of caramelized brown sugar on top, properly burned. We enjoyed a very nice Austrian sweet wine with that, a Traminer Auslese from one of the great ones, Ernst ‘E.T.’ Triebaumer of Rust at the Lake Neusiedl. 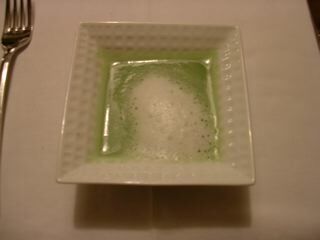 The third course was a crème of leek. Actually it was creamy but lighter, more like a foam or froth, topped with a hint of sweat crème. Again we were enticed by the intensity and naturalness of the aromas. We finished the glass of Muskateller with it. 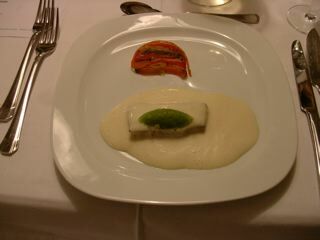 Next up was a filet of St-Pierre with an allspice and citrus nage. The St-Pierre was served a little bit of mashed potatoes and – surprise – a slice of black pudding pancake. While the fish and the black pudding don’t combine directly, they formed an interesting contrast, while each of them combined surprisingly well with the aromatic nage. We started a bottle of white with that, a chardonnay from the wine growing region South of Vienna called ‘Thermenregion’, vintage 97 and made by well-known vintner Reinisch of Johanneshof. A real whopper, broad, full-bodied with nice oak and lively acidity. It reminded us a lot of a very good Merseault once it opened up. The meal continued with slightly smoked catfish (the European variety which doesn’t have red meat and is a tad more delicate in aroma) served with crème of potatoes and wasabi caviar. Again an explosion of flavors and aromas that combines formidably. The wasabi caviar turned out to be greenish in color with a hint of wasabi aroma but no spiciness and was similar to flying fish roe in size and consistency. The catfish had the most complex smoke aromas I’ve tasted in a long time and that in turn combined very nicely with the vegetable side. 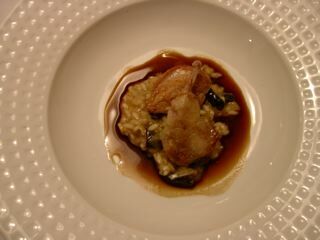 To spoil us further, the next course was quail breast, crisply grilled, on a risotto with sweet and sour mushrooms. While I usually prefer a red, a good Pinot if possible or it’s Austrian cousin, St-Laurent, with quail, the delicate sweet and sour aromas of the mushroom risotto found a wonderful partner in the chardonnay that had opened up by now. What else, as expected, the consistency of the risotto was perfect, the proper bite and the right creaminess. The next course – and it was starting to get tough – was an Eastern Austrian specialty called ‘Kalbsbeuscherl’, a ragout containing calf lungs and heart that have been marinated in Riesling. Typically it’s finished with cream and served with some type of dumpling. 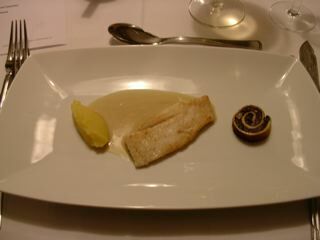 The dish was delicious though abundant for a degustation menu. To cool things off we were next served a very intense pear sorbet that helped us consider any further food – the true purpose of a sorbet as alternative to the ‘Trou Normand’. 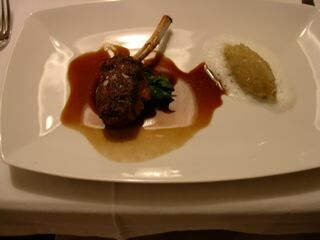 We joked about the next course mentioning just young lamb, not which cut so I teased my wife about a full lamb to come. Of course it wasn’t, instead it was a nice, perfectly cooked, medaillon on the bone with a crispy olive crust and ‘topinambour’, a slightly sweetish root vegetable that has been widely replaced by more versatile and better producing potatoes centuries ago. The lamb was to the point, actually to my preferred point which is medium rare, juicy, tender and delicate in taste. I had a glass of wonderful Barbera with it, from Alba, the Italian truffle capital in Piedmont- a good idea as it turned out with the next surprise course. Not mentioned in the menu list was the surprise cheese course. A dish that reminded me of Lucito’s legendary Pommes Salardaise. They took a nice, not too salty blue cheese, put several slices of truffles on it, next a buttery Gouda-like cheese, again a few slices of truffles, and topped it off with a ripe goat cheese, white culture, and again truffle and some truffle oil. As the top was warm and slightly melting I suspect they briefly put the plate under top heat. 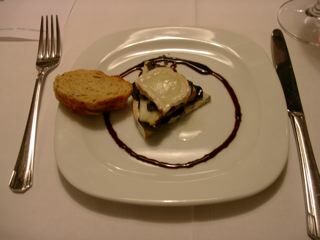 The result was unbelievable and the different cheese aromas and the truffle flavor mixed stunningly. As indicated, the Barbera was a perfect match here. 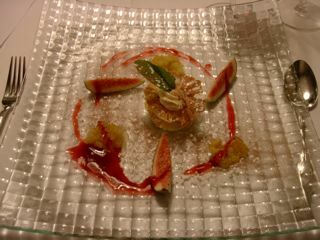 As Austria is a desert country the degustation menu ended with two instead of one deserts. First was a Mille Feuilles with very nice coffee crème and baby pineapples and sliced figs and finally, more traditional, cheese dumplings with homemade plum compote. By then it was eleven and we were both, stuffed and tired so we retired upstairs and fell into bed. We slept very well until about 8:30 – usually we both work already at 8:30! The bathroom held another surprise for us – a wonderful whirlpool with air jets that helped to wake us up properly. Surprisingly we were not stuffed anymore and as breakfast was included with the room we went downstairs. For all of those wondering, YES we did get our new car, and we took a few days off driving around town to break it in. Yesterday was a holiday here and Normita took Monday off to make an extra-long weekend. We would have like to go out of town for 4 days, but since we did not get the car until Monday evening, we could not do that. This will have to wait for another weekend. We decided to celebrate the coming of spring and I researched what was traditional for this time of the year. It seems that egg dishes are the norm and also desserts with honey in them. I prepare a nice smoked salmon quiche for the main course, and I will post the recipe in coming weeks. For desserts I instantly thought about Baklava, but I did not have the patience to bake some as the weather was too nice and the new car was beckoning. I then decided to create a nice honey pie recipe. It turned out stunning so I decided to share it with you. It is very easy to prepare and I baked it before leaving for the day, yesterday morning. Once it was out of the oven and cooled I left it on the counter with a clean dish clothe on top, so it was ready for when we returned. You can bake this easy pie in a prepared uncooked pie shell, prepare you own dough, use some frozen puff pastry, or do like I did, buy some fresh puff pastry at the supermarket and roll your own pie shell in a few minutes. An easy trick there is to use a large plastic cutting board so that the puff pastry dough does not stick. Make sure that you put enough flour on both the board and the top of the dough before rolling. With light pressure roll a square of dough to a size that is about 2-3 inches bigger than you pie plate. While rolling the dough flip it over a few times and dust it and the board with flour every time you do so. It only takes a few minutes and I find this much better than most regular prepared pie shells. I prefer to use a sturdy non-stick-coated metal pie plate as they conduct heat better than glass ones. 1. In a saucepan heat the honey until it boils, then retire from the heat. 2. Slowly add the beaten eggs while stirring continually so as not to create an omelet. 3. Add the butter and stir until melted and well incorporated. 4. Add vanilla, Scotch, and spices. Stir until you have an homogeneous mixture. 5. Fold in the chopped walnuts. 6. Pour the mixture into your prepared pie shell. 7. Bake in the middle of a preheated 350F oven for about 30 minutes, or until the center of the pie is set. 8. Cool down on a rack before serving. Yesterday we were supposed to receive our new car, as the dealer had told us they received it earlier in the week and they would prepare it for either Friday or Saturday. It seems that they lied to us as the car was arriving in the country from Brazil early in the week, and won’t be at the dealership until Monday or later in the week. We had planned a mini-holiday for the long weekend as it is a holiday here on Tuesday and Normita decided to take Monday off to make a long weekend out of it. As you might think from the above story, we were not in too good of a mood yesterday, but we decided to enjoy the nice windy weather and walk around the neighborhood for part of the afternoon. During our extended walk we came across a nice restaurant that looked very inviting. It is called El Habanero in honor of this most powerful of ‘chiles’ from Yucatan. They specialize in authentic Mayan cooking from Yucatan, and after looking at the menu we decided to return after a bit of freshening up at home. The restaurant ambiance is pretty informal with a decor inspired by Mayan traditions. It seems that they cater to the business workers during the week and to families and regular client on the weekends. As with most restaurants that cater to local crowds it is not open in the evening, because the main meal here is at 2-3pm. They are open from 8am to 6:30pm from Monday to Sunday. There is a wonderful group ‘el Trio Los Faisanes’ that plays beautiful traditional Mexican trio music daily from 3 to 6pm. The relaxing atmosphere and beautiful music made us forget our problems and we came out of the restaurant 3 hours later feeling 100% better and in a perfect mood. The wonderful food was a great mood enhancer too. We started with a ‘sopa de lima’, a traditional Mayan soup consisting of chicken broth, sour limes, lots of shredded chicken breast meat, and fried tortillas. It was exquisite and settled our stomachs for the rest of the meal. The manager recommended that we start with a mixed Mayan platter consisting of two ‘panuchos de cochinita pibil’, two papadzules, and two ‘garnachas de lechon’. The ‘panuchos’ are miniature corn tortillas served with a layer of refried beans on top, then a serving of ‘cochinita pibil’ a delicious dish made with slow roasted pork with spices and ‘achiote’, an intensely red seed that is ground into a paste then mixed with spices that is a traditional seasoning of Mayan cooking. The ‘panuchos’ are then topped with some spicy marinated red onions. The ‘garnachas’ are made with some of the same miniature tortillas that are deep fried, and then well drained of the oil after frying. When the tortilla fry they inflate into flat globes and the top thin layer is removed to create a nice little nest to put a filling. The ones we had were made with some ‘lechon’, an exquisitely tender slow roasted suckling pig. They were topped with marinated white onions. The ‘papadzules’ were again miniature corm tortillas filled with chopped hard-boiled eggs like miniature crepes, and topped with a delicious creamy sauce of green pumpkin seeds. After this nice sampling we decided to share an order of ‘panuchos’ and one of ‘garnachas’ to finish the meal. They were so nice that we both wanted more after the sampling platter. As is the custom in most Mexican restaurants and homes, various homemade sauces are placed on the table to accompany the dish. What we had was some chopped onions with finely chopped chile habanero, the most potent chiles in the world, and a staple of Yucateca cooking. This very spicy condiment was a great complement to the soup. The other salsa looked like the typical ‘salsa verde’ that is a staple on all tables here. Normita lives for her ‘salsa verde’, but I normally shy away from it as I find the ‘tomatillos’ (green ground tomatoes) and onions in it a tad bitter and at time there is an excess of jalapeños that tends to make it unbalanced. This time the sauce was stunning, with a beautiful green flavor that was exquisite. I thought that instead of the jalapeños they were using habaneros, as the extreme spiciness and the taste hinted to that. We liked it so much that we emptied the bowl as a topping to the ‘panuchos’ and ‘granachas’. We were very surprised to learn that the sauce was simply finely chopped green habaneros in vinegar. The manager told us that he stays away from it as he finds it too spicy, but both Normita and I liked it so much, despite the spiciness, because of the very nice flavor it gave to the food. In any case after the first half of the bowl our mouths were so used to it that we were not noticing the heat. We kind of paid for it this morning when we went to the bathroom, but this is the price you have to pay for eating great spicy food. Pricing was reasonable at around MX$300/person (~US$28) including drinks and tips, and we definitely recommend visiting this charming restaurant if you are ever in Mexico City. 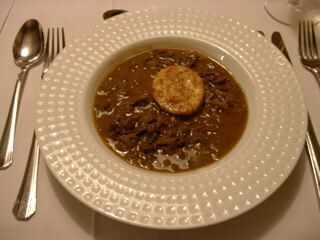 We definitely will be returning to try some of the venison dishes and other Yucatan specialties.